Pennywise and the Losers Club can take a hike. 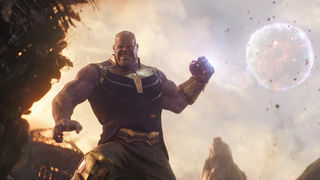 The first Avengers: Infinity War trailer is now the most-watched trailer in history with 230 million views in 24 hours. Stephen King's IT held the record since last year with 197 million, but it's time for Richie, Bill, Beverly, and the rest to go float somewhere. The children of Derry, Maine never stood a chance against Thanos and the biggest Marvel team-up of all time. Once the numbers were crunched, Marvel Studios took the time to thank everyone who helped them break the record. You'll notice four of the five movies on that list are Disney-owned. The company knows how to roll out a trailer in the most effective way possible. We know what you're thinking and the answer is no. Cap's beard was not added in post-production. He's not Superman, after all. Josh Brolin's chin crags were, though. Well, probably.